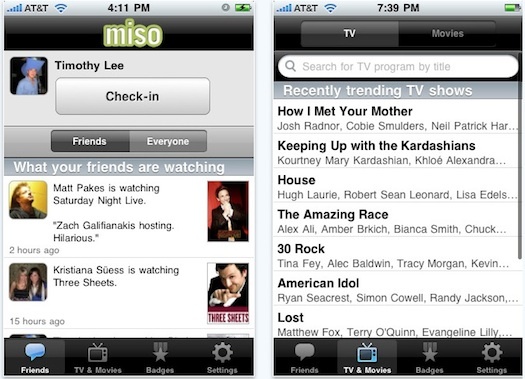 Tonight I came across Miso, which is basically Foursquare for TV shows. When you’re watching a show or movie, you “check in” and the show gets added to your profile. You can see what your friends are watching, and conversations can be built off of the check-ins. You also gain badges based on your viewing behavior. I’ve been musing Boxee to watch TV for the past few months. When I listen to music in Boxee, it logs that data to my Last.fm account. (So does my iPhone, home computer, and work computer.) I’ve had this account for years, and it does a pretty fantastic job of recommending new music to me based on a huge dataset. I hope that Miso can build a recommendation engine as well. I’d also love to see Boxee integrate Miso as well, so that I can check-in to a show from within the app. Just a couple things on my wish list. Be sure to check out Miso. Read more at MobileBehavior.